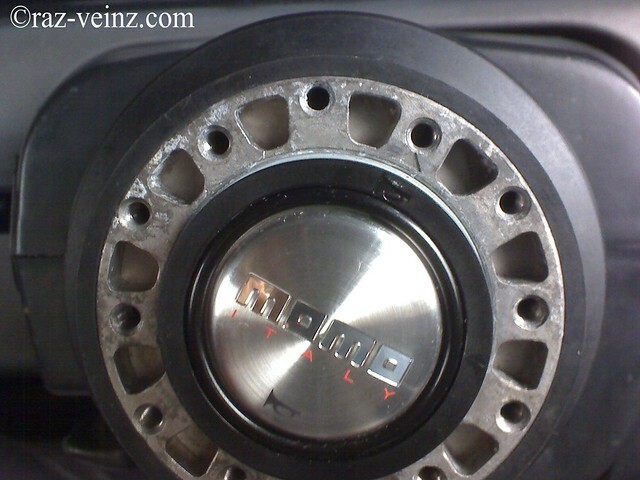 For better handling and stylish, this upgrade is the most, why I choose MOMO? 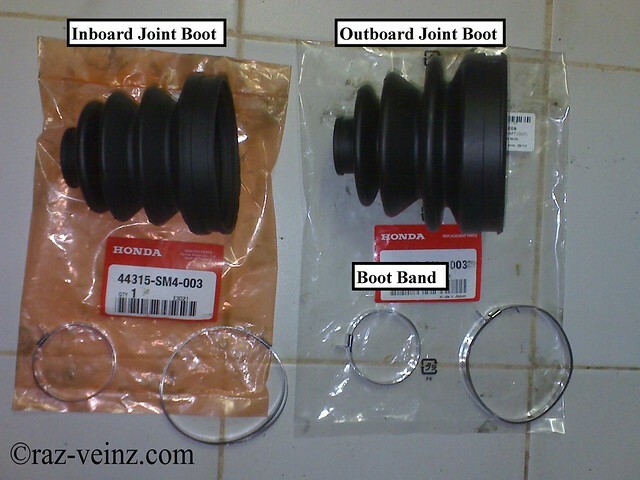 because Honda choose them! 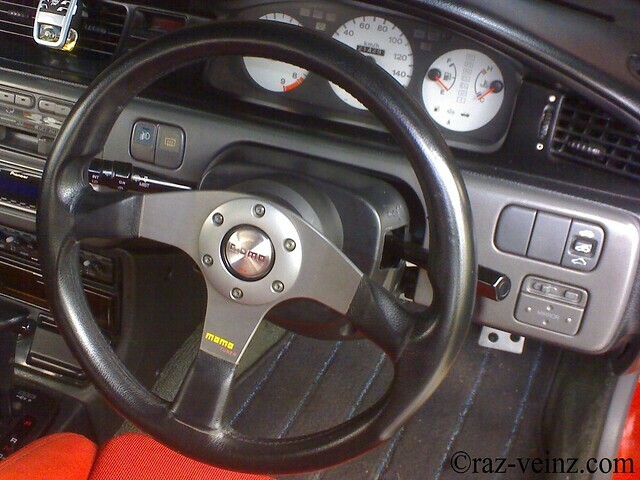 MOMO steering wheel is the standard accessories for Honda NSX, Integra DC2/DC5 and Civic EK9 Type-R! 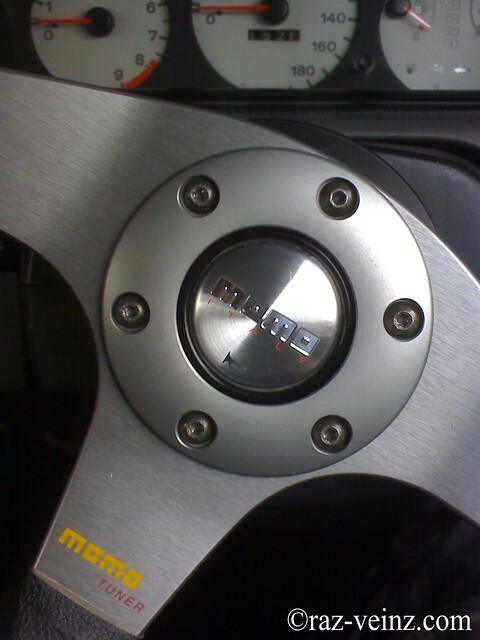 The steering wheel come with the thick leather anatomic grips design, that give you a firm grip and positive steering feel that you just can’t get from the stock wheel. 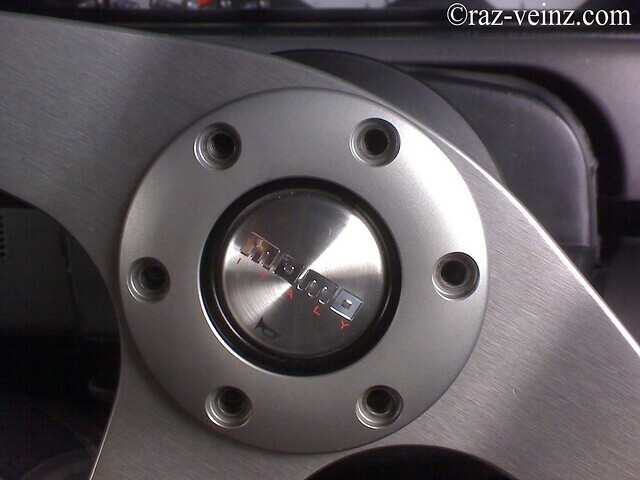 A bit smaller diameter and aluminum material make it weigh half of my standard EG9 steering wheel! Better not to choose the smallest size, it will ruin the daily driving (except you want to feel like driving the go cart). 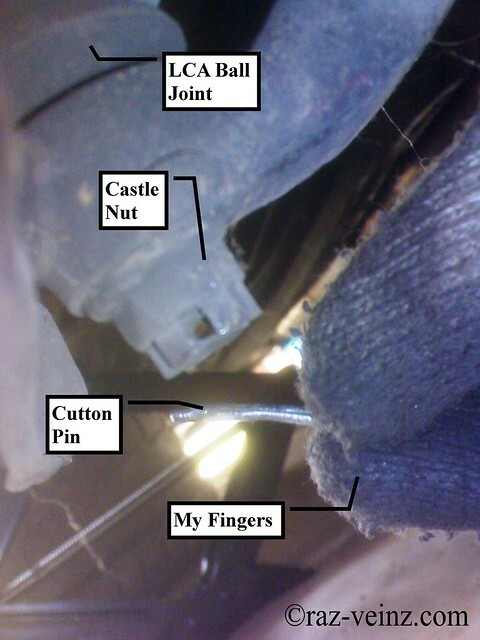 To install, is straight forward job, unless if you have an air bag, have a little bit tricky! 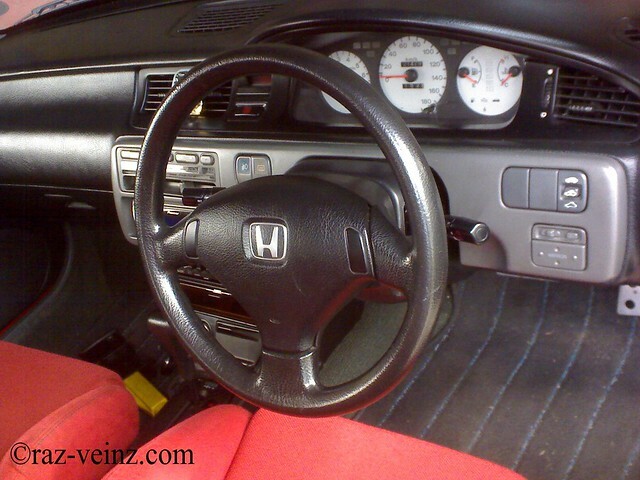 Need suitable steering wheel adapter (steering hubs/boss kits), DC2 and 1992 – 1995 Honda Civic EG are interchangeable. 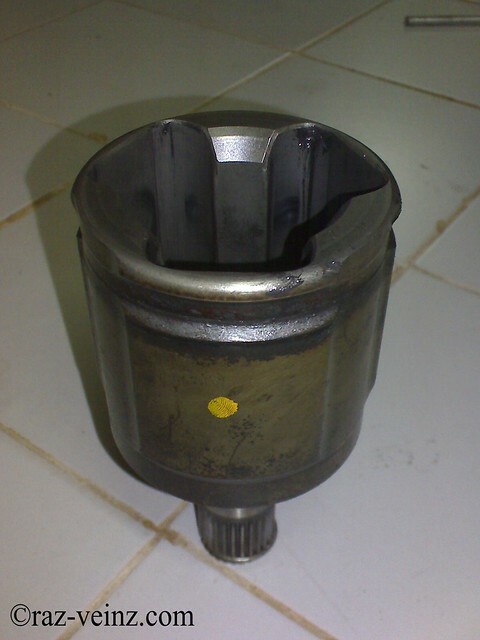 Remove the center pad and the steering wheel nut, no need a special tool, enough with the socket and extension, the nut will be fairly tight. Remove the steering wheel by rocking it slightly from side-to-side as you pull steadily with both hands. 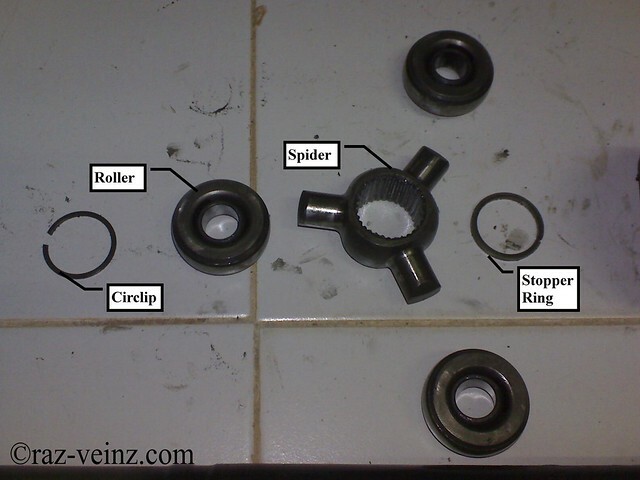 Install the steering wheel adapter (steering hubs/boss kits). 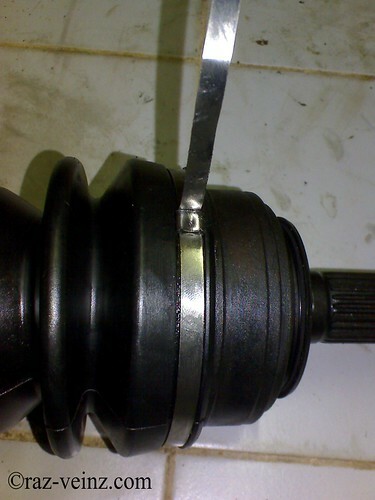 Be sure the steering wheel shaft engages the turn signal canceling sleeve. 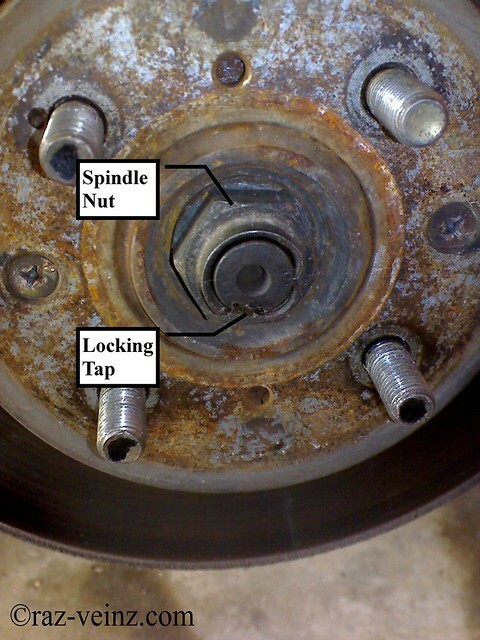 Install back the steering wheel nut. 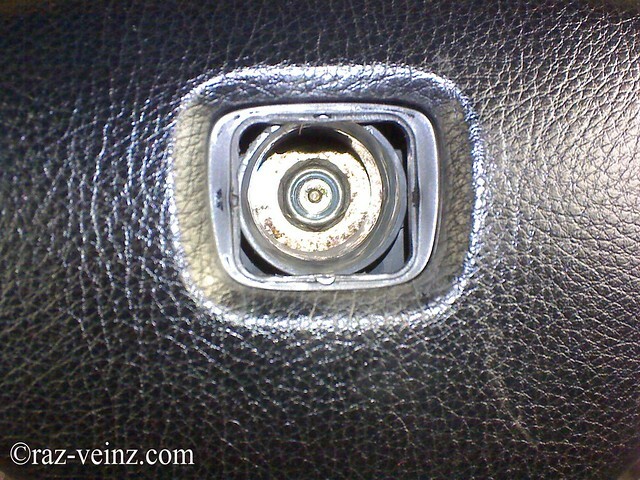 Install the horn button, connect the two wires to the horn button. It doesn’t matter which wire goes to which connector. 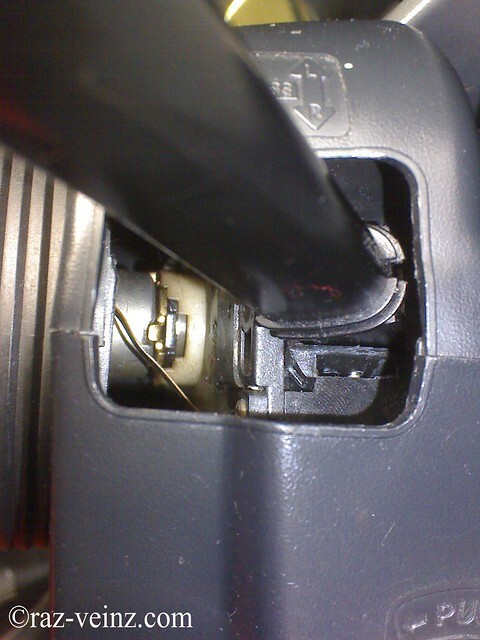 If there no connector for the ground (body) just touch it at any place at the steering wheel adapter, put the tape or rewiring, etc., as long as it will stick there. 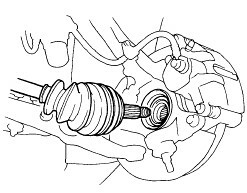 Verify the horn operation. 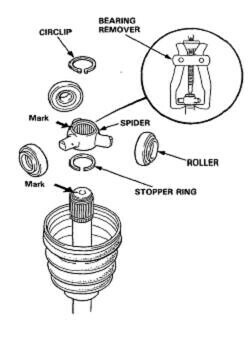 Make sure the steering wheel adapter arrow in the center position. 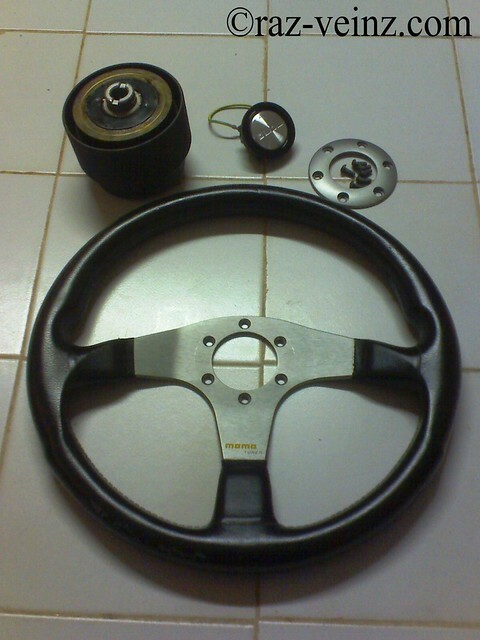 Insert the MOMO steering wheel and the adapter plate. Secure it with the hex screw and everything is done. Easy right? The silver spoke match with the dashboard. Then take the car for a ride and verify that the turn signals shut off properly after making a turn and don’t forget to attack the corner! What you’re aspect from the moving parts? 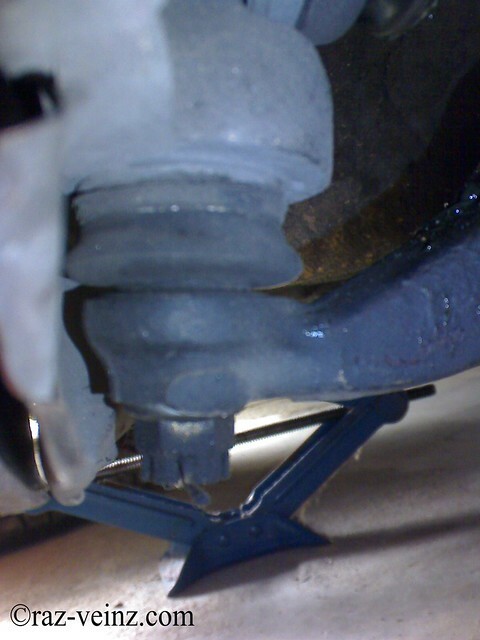 Although the CV joints are EXTREMELY tough, but the rubber cover that protects the drive axle joint, it’s also known as the CV (constant velocity) boot, is not. The boots will tear (like mine) or crack over time, and the grease that the boots hold inside will leak out. 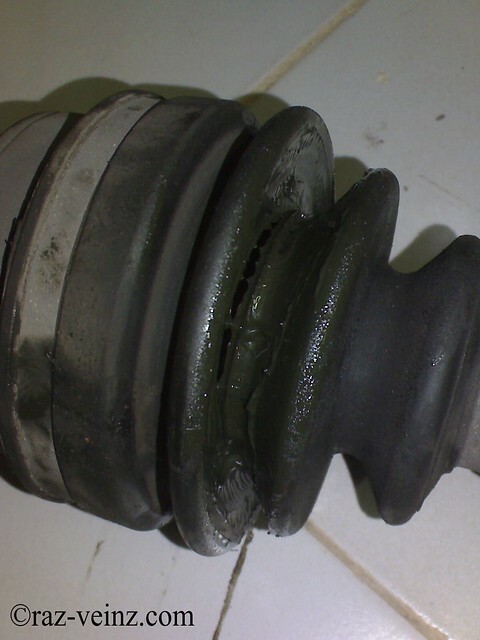 The CV joint will then be exposed to dirt, moisture and other debris, so you can replace them before damage is done to the more expensive CV joint. 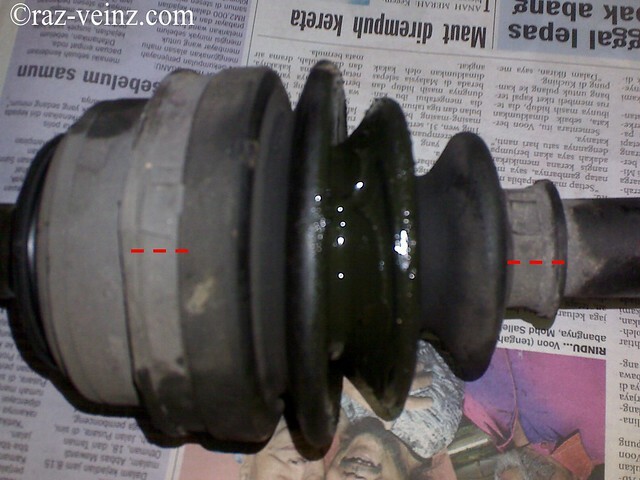 Remember CV joints also are EXTREMELY expensive! 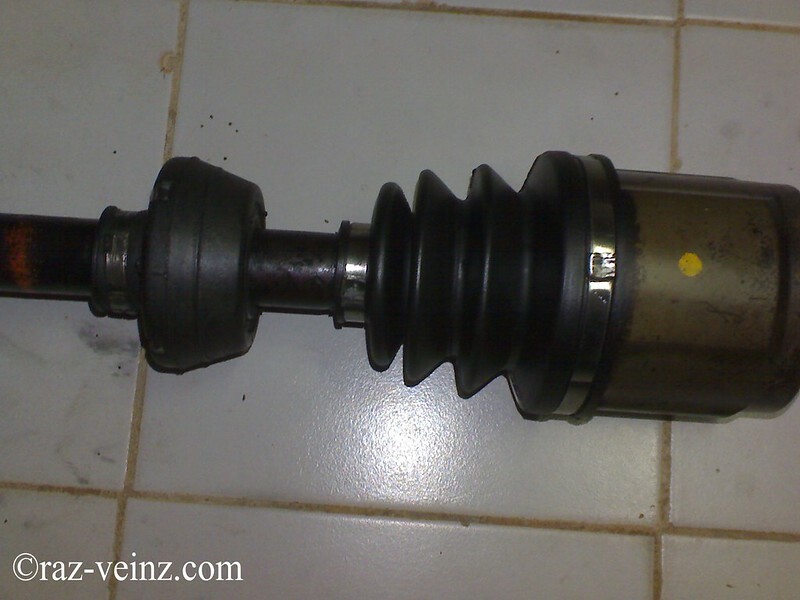 The boots will be the indicator for you to service the CV, time by time, heat by heat, the grease itself will degrade, now it’s time to inspect and refresh! 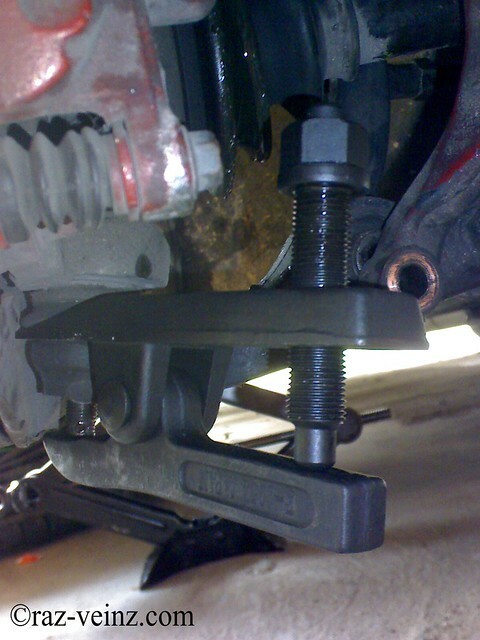 Raise both front wheels off the ground and secure car with jack stands . 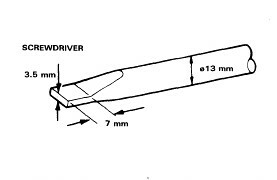 Remove wheel. 1. The easier way, use the impact gun! Or machine gun! 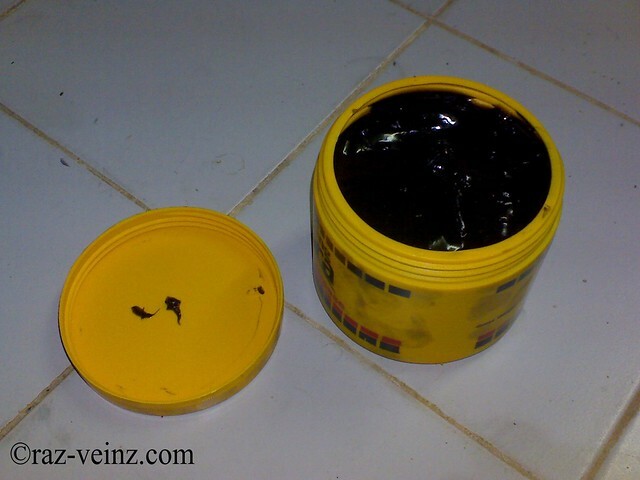 (Just Kidding), if you didn’t have any, just go nearby workshop, just loosen it, not to remove! 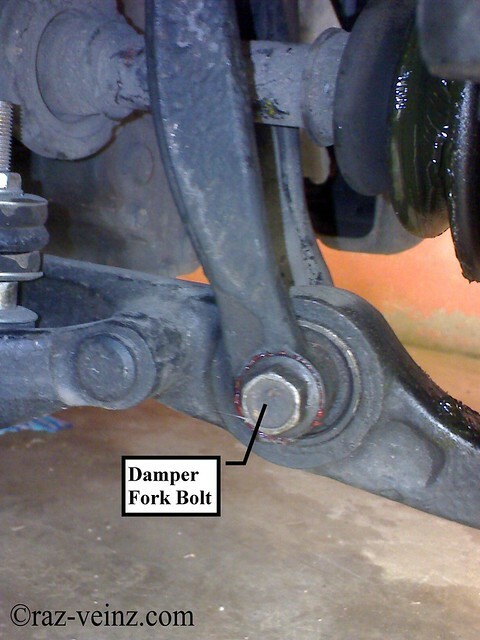 Then hand tight it with the breaker bar, drive slowly to your home and remove it with the breaker bar. 2. 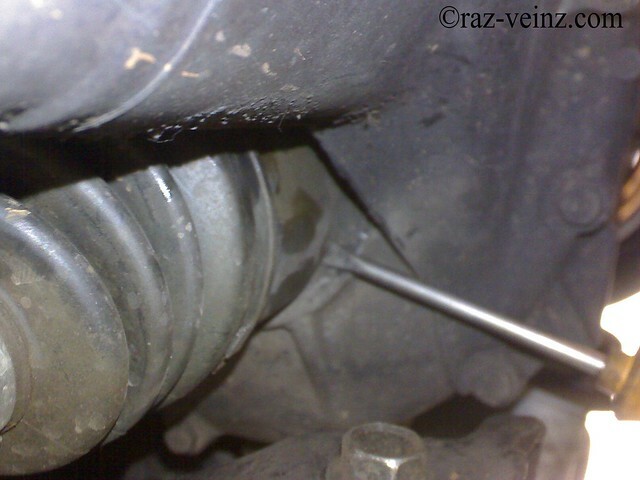 Using fully of your superman power with the breaker bar and socket extension to remove! 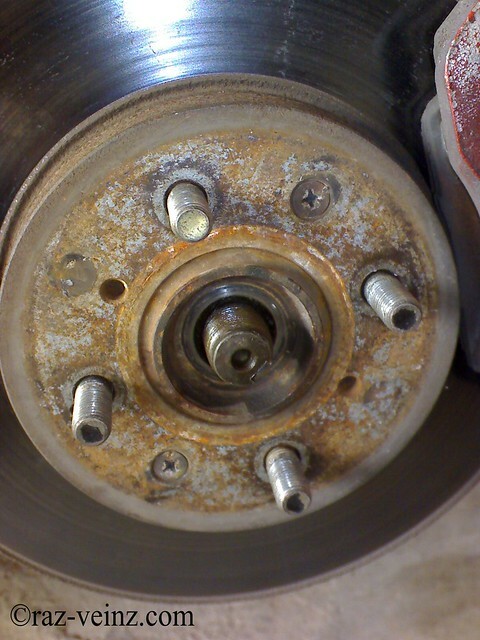 Make sure your wheel still on the car (with the the center cap remove if you have any) and your car on the ground and ask your friend or neighbor to push the brakes to lock the rotor from spinning. 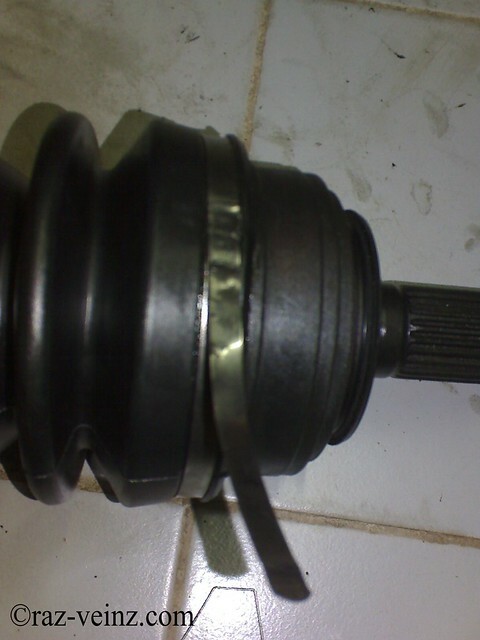 To remove the Honda LCA ball joint, I highly recommend you to using ball joint remover, that make your life easy, because Honda ball joint is superior tight, some people may prefer use hammer or ‘jack technique’ . 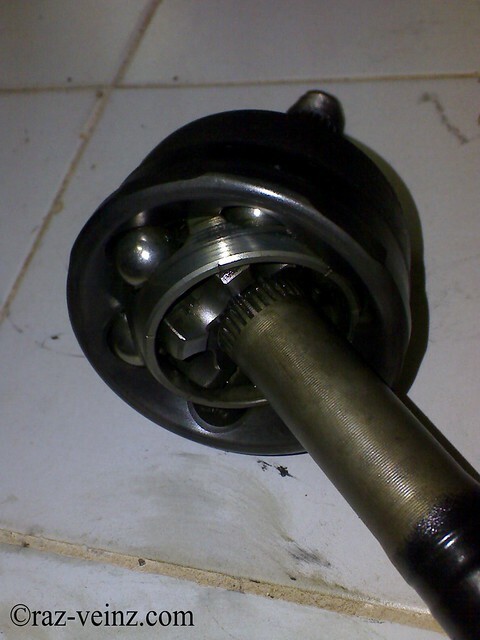 Pry the driveshaft assembly with a screwdriver as shown to force the set ring at the driveshaft end past the groove. 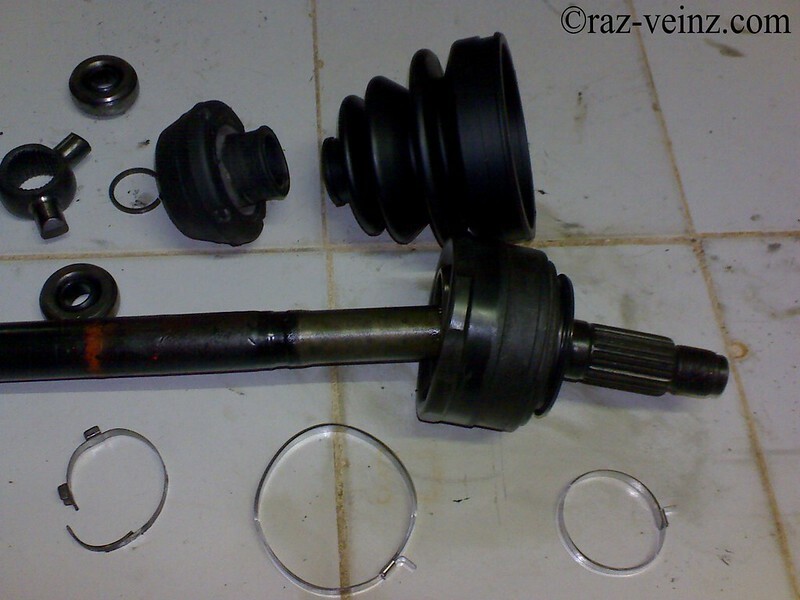 Pull the inboard joint and remove the driveshaft and CV joint from the differential case as an assembly. 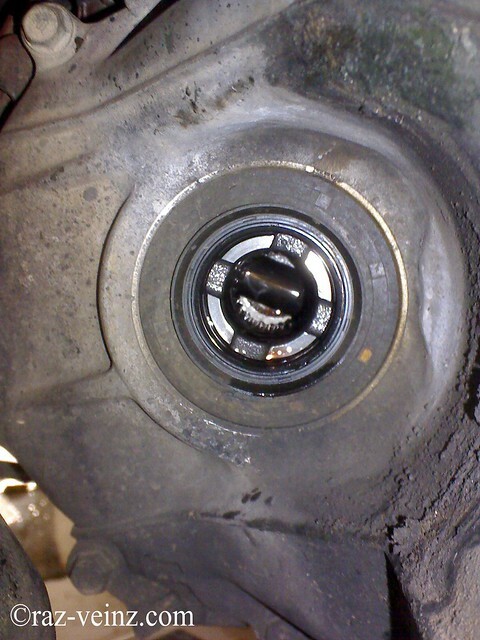 Remove the right driveshaft from the bearing support by tapping the inboard joint of the driveshaft with a plastic hammer. 1. 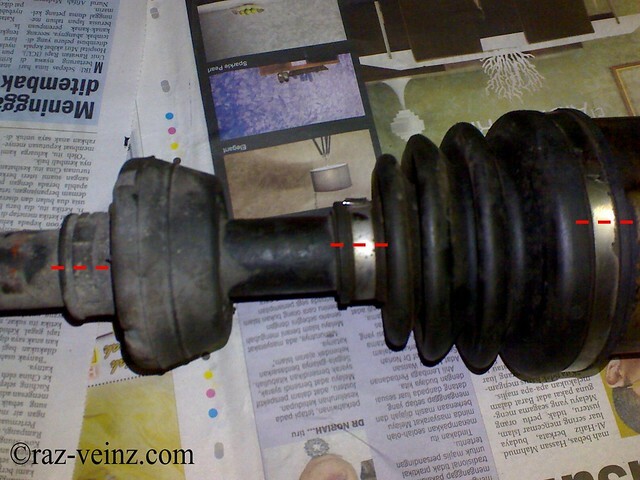 Do not pull on the driveshaft, as the CV joint may come apart. 2. 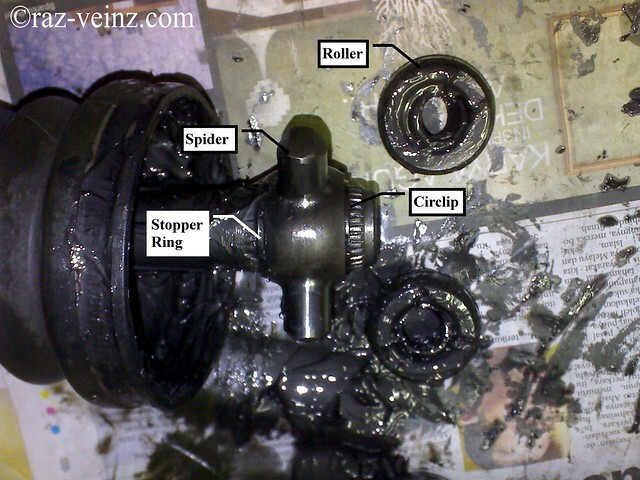 Use care when prying out the assembly and pull it straight to avoid damaging the differential oil seal. 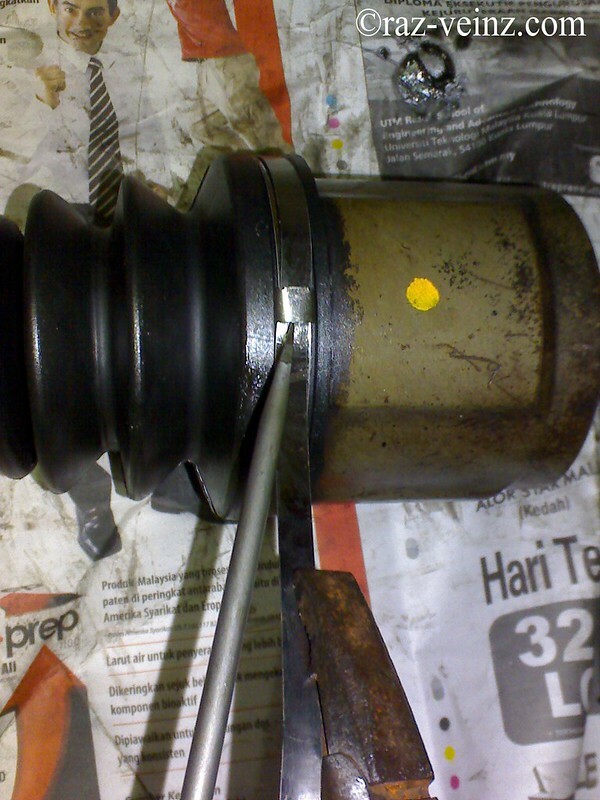 Pull the knuckle outward and remove the driveshaft outboard joint from the front wheel hub using a plastic hammer. 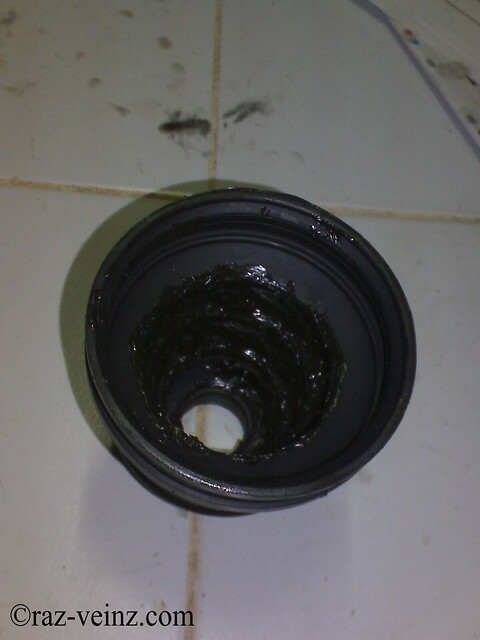 This is the best time to check the differential oil seal for any wear. 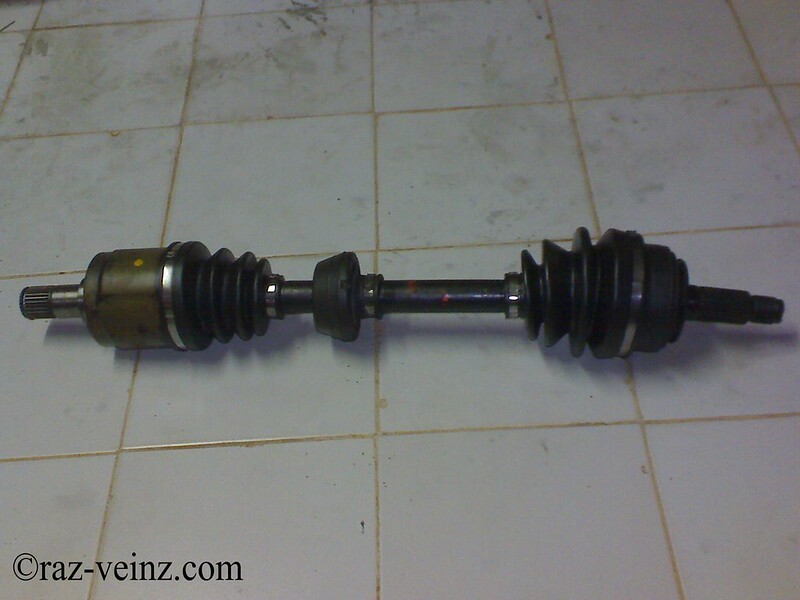 This is the main part of the driveshaft, I only remove the driver side (right hand drive), the passenger side is quite similar, except its link with the intermediate shaft that link to the gearbox. 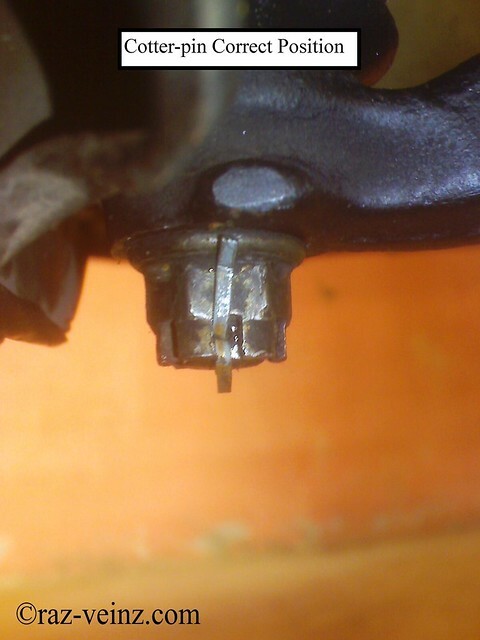 The leaking point at the outboard joint boot close up. Cut out all the boots band (red dashed line). 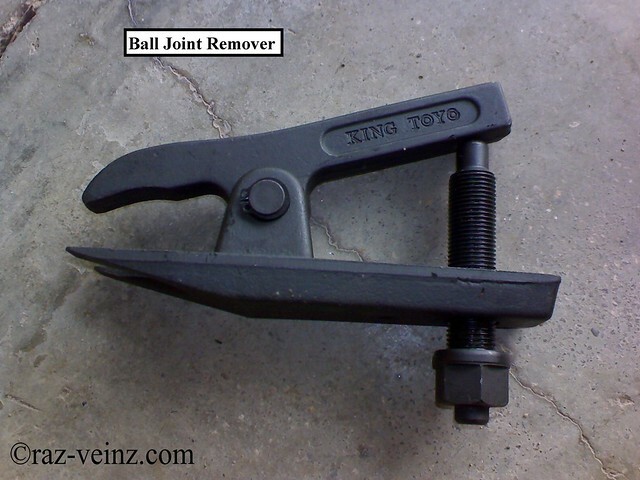 Remove the inboard joint and roller. 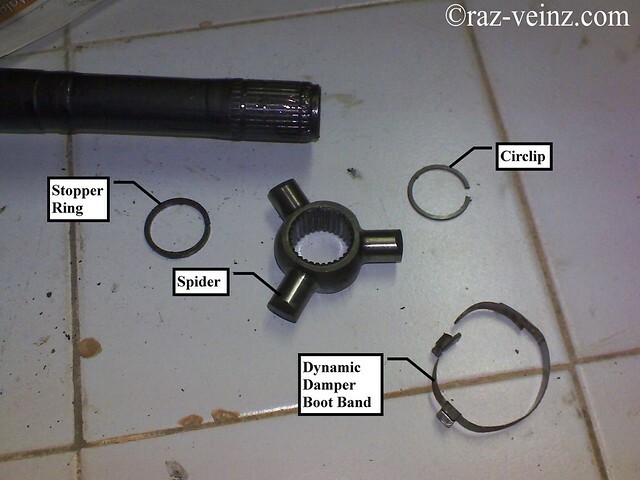 Remove the circlip (using circlip remover or anything that suitable), according to the manual service, it’s a good practice to install everything back in their original positions, mark the spider and driveshaft then remove the spider using a commercially available bearing remover, but I am just using plastic hammer and its work. 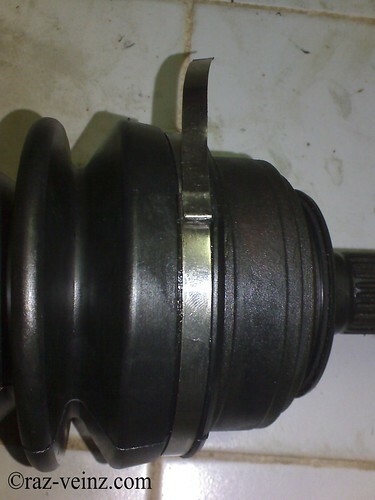 It’s hard to remove the stopper ring, the only reason I remove it, is easier for me to remove/install the dynamic damper and boots, you should consider before removing it. 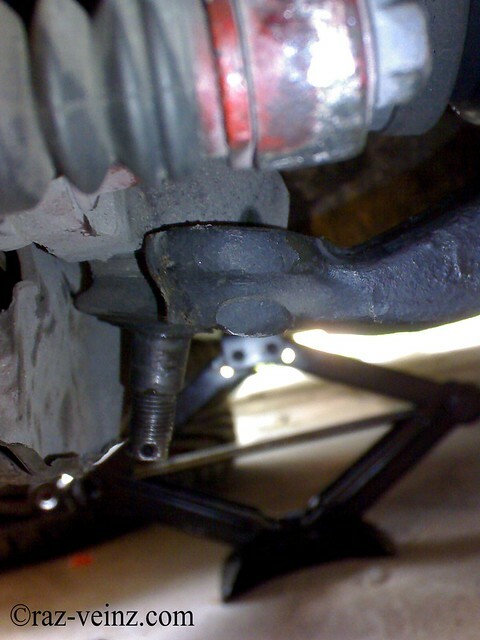 Then remove the inboard boot and dynamic damper from the driveshaft. 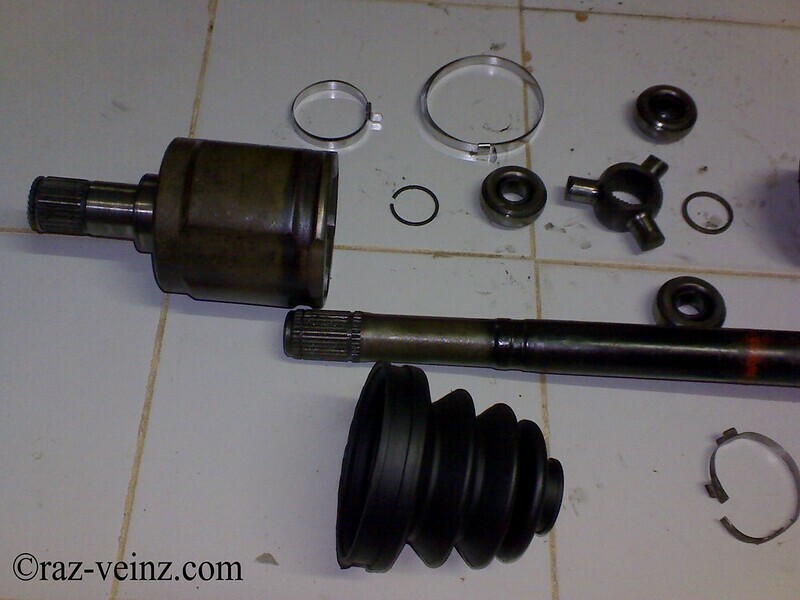 Inspect and clean everything, remove as much of the grease as possible, replace circlip or stopper ring if needed. 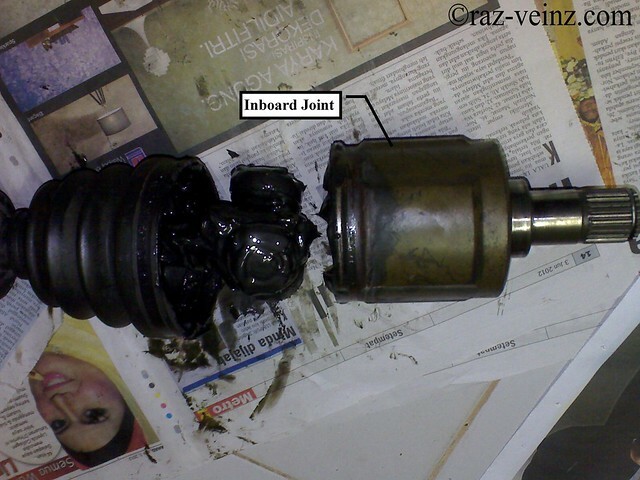 Inspect and clean the inboard joint. 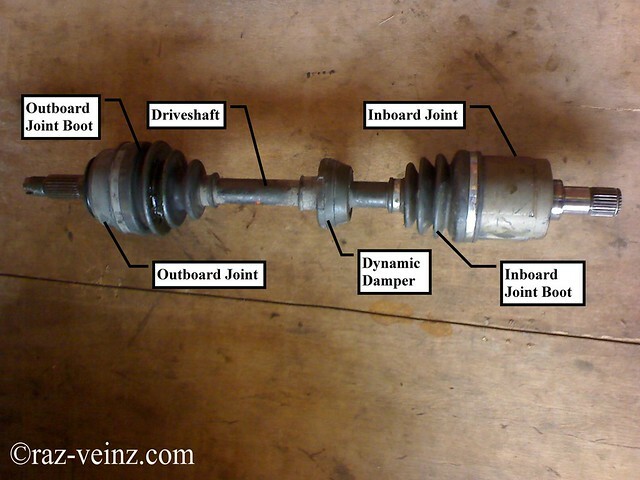 Remove the outboard joint boot. 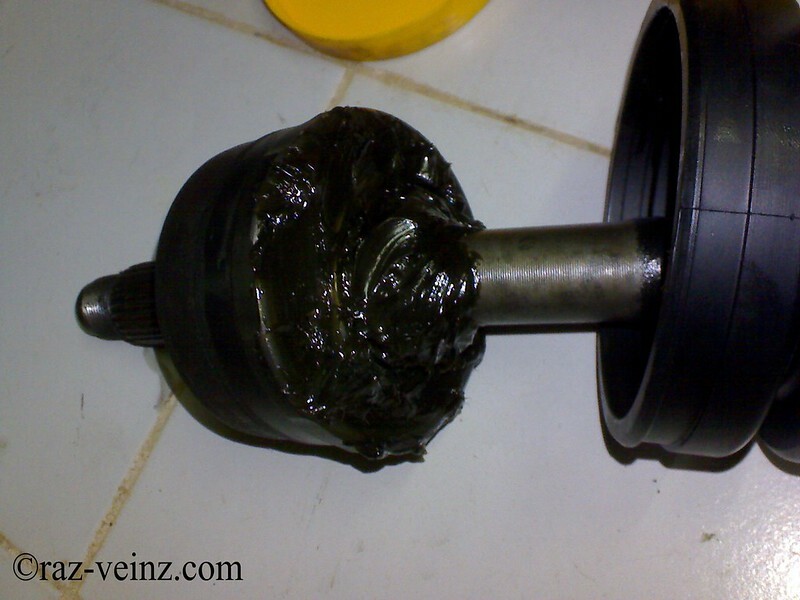 Clean the outboard joint from grease. 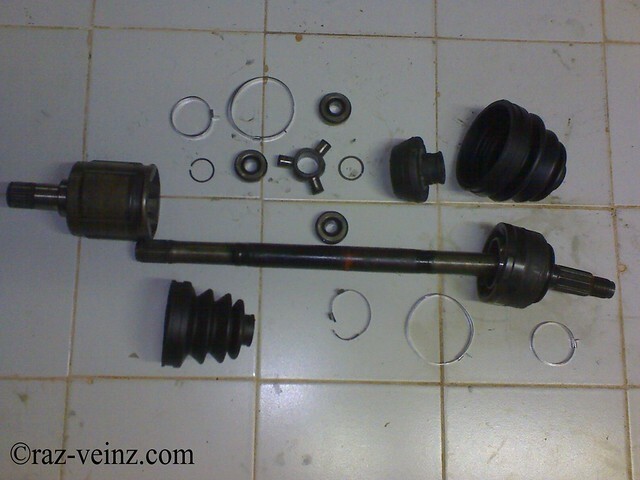 Inspect for faulty movement and wear, according to manual service, this part should not be disassemble. 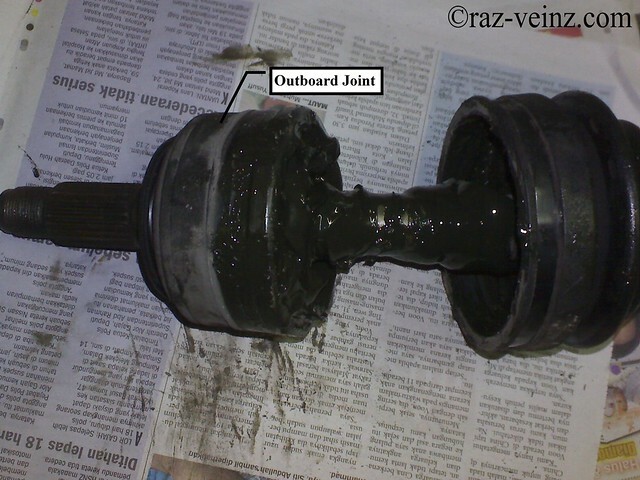 Pack the outboard and inboard joint including inside the boots with the driveshaft/joint grease. 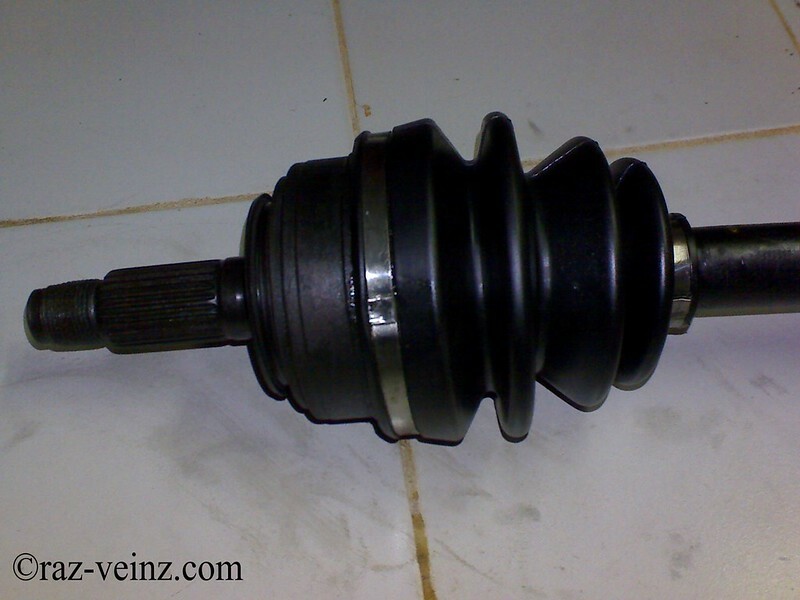 Recommended grease quantity, inboard joint –> 120-130 g (4.2-4.6 oz), outboard joint –> 90-100 g (3.2-3.5 oz). 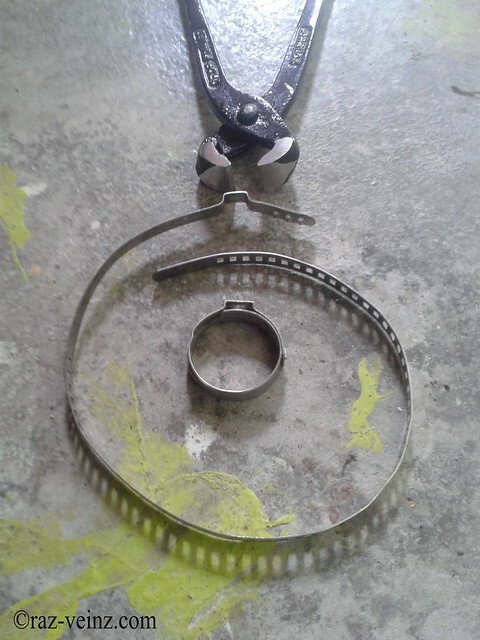 But, I prefer to use this type of clamps (need to buy separately), easy and more clamping force, cheap clamping plier like mine is good enough to securely clamp the boots. 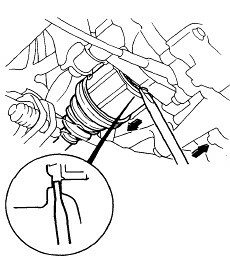 Reinstallation is the reverse of removal, DON’T FORGET to put the cotter-pin back, the picture show the cotter-pin correct position. 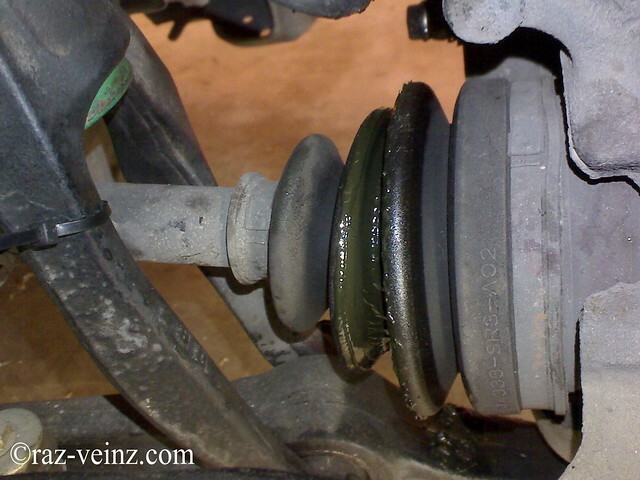 Just remember to tighten the suspension to the final torque in the loaded position. 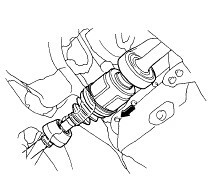 To do this, install suspension bolts loose (not even wrench tight), rest the car on ramps, and then tighten the bolts to their final torque. Another tear has been wiped! 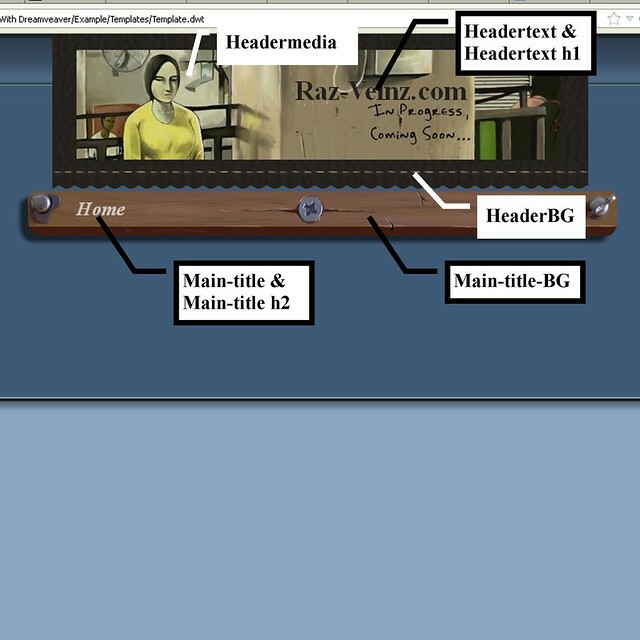 Header is graphical/media content or only text that runs across the top of the web page design on your screen, header is very important and most valuable space on the screen, it will make someone fall in love at the first sight with your webpage or love to click the close tab button immediately. The primary purpose is to promote your company’s brand and make it instantly recognizable to your audience. It will be anything! Depend on your purpose and creativity, I choose to use Flash or rectangular image. 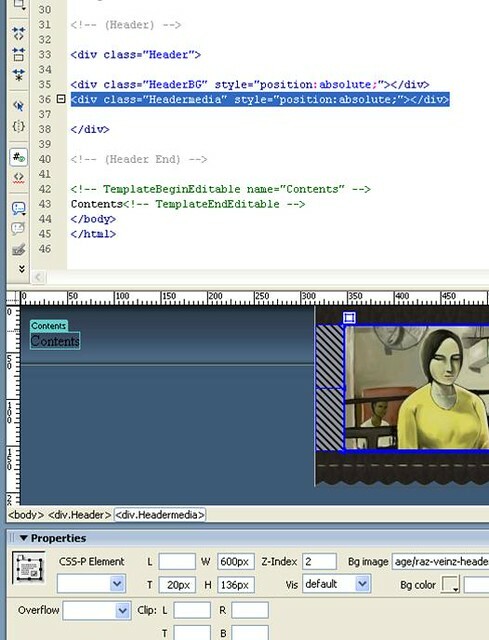 .HeaderBG and .Header is just the name, you can put any name that you want, DO NOT start a class name with a number! This is only supported in Internet Explorer. Just don’t forget to put the “.” at the first letter to defined the HTML class attribute (will explain later). 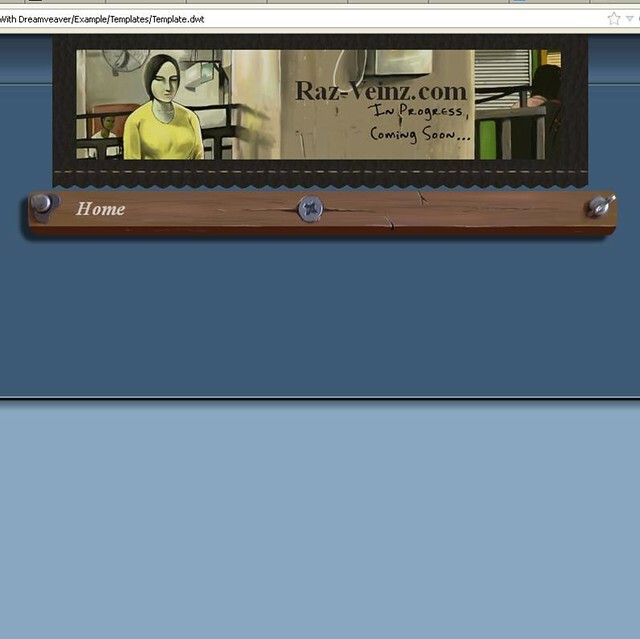 This name is used to create a direct relationship with the HTML tag that you want to edit. <!– (Header) –> Note : this is the comment tag ( <!–…–>) Comments are not displayed in the browsers. class – It is used to create different classes of a element, where each class can have its own properties. The class attribute is mostly used to point to a class in a style sheet and let you apply style properties to any element or elements on the page. 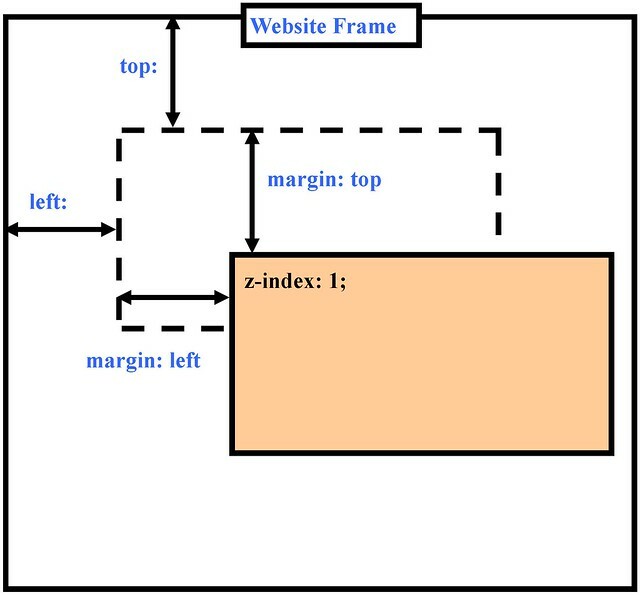 style – The <style> tag is used to define style information for an HTML document. 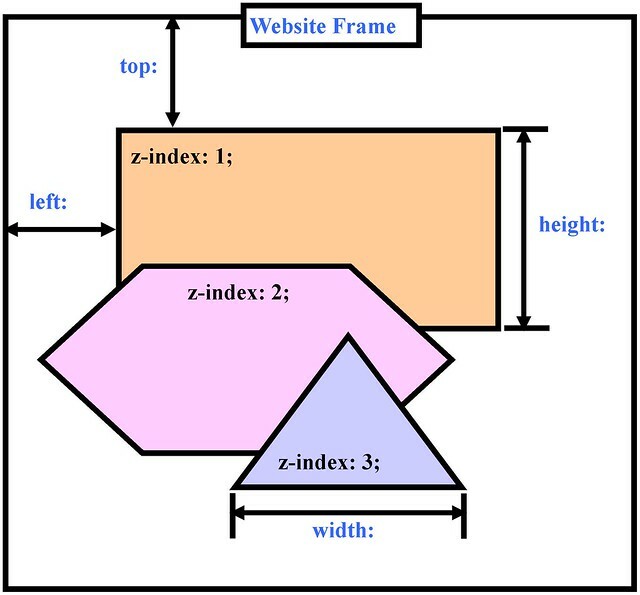 Inside the <style> element you specify how HTML elements should render in a browser. 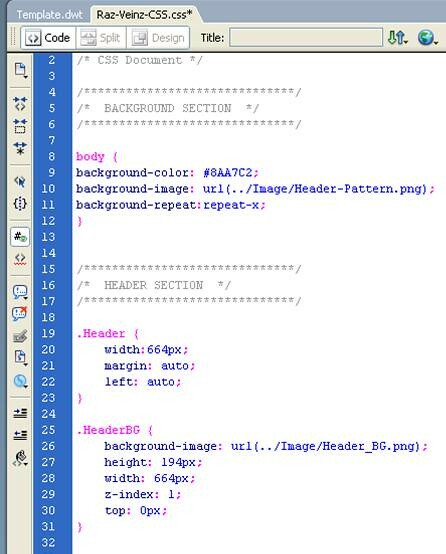 Each HTML document can contain multiple <style> tags. That image is only for the background for the main image, if you want to put only plain image, the procedure is similar, just need a little bit modification, the name for html code and the name, the image link, background-repeat: no-repeat;, margin, top, height, width and z-index (make sure the value is more than background image z-index value) for the CSS code . 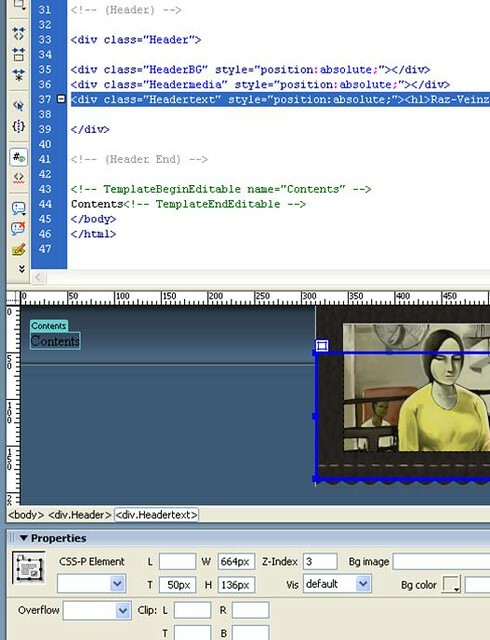 If you want to put the Flash, used this Flash Satay Method, the valid W3C’s standards, this is the original code, of course, you need to create the Flash media first! Flash media have advantages and also disadvantages, read more here. 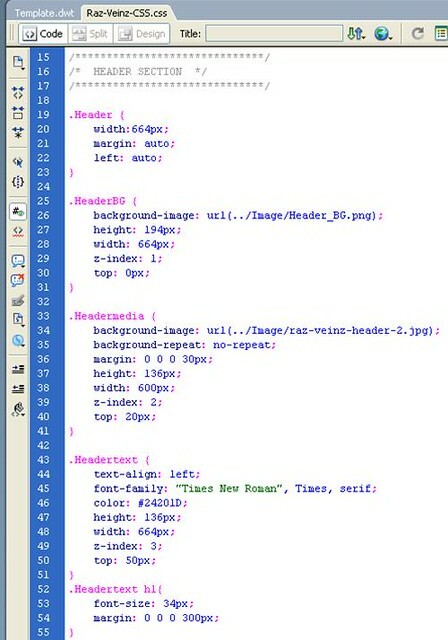 The <h1> to <h6> tags are used to define HTML headings. <h1> defines the most important heading. 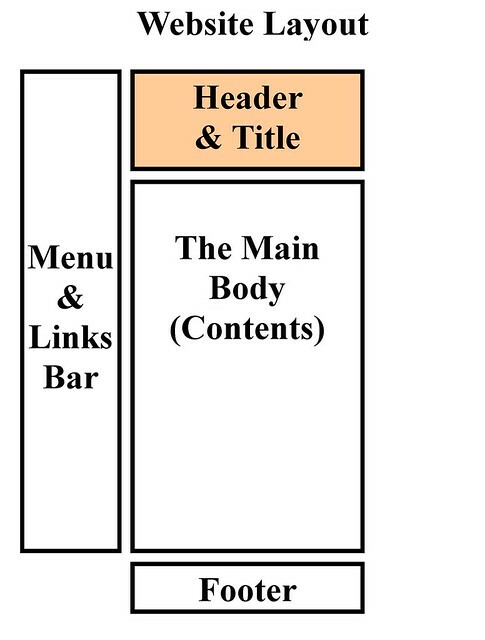 <h6> defines the least important heading. 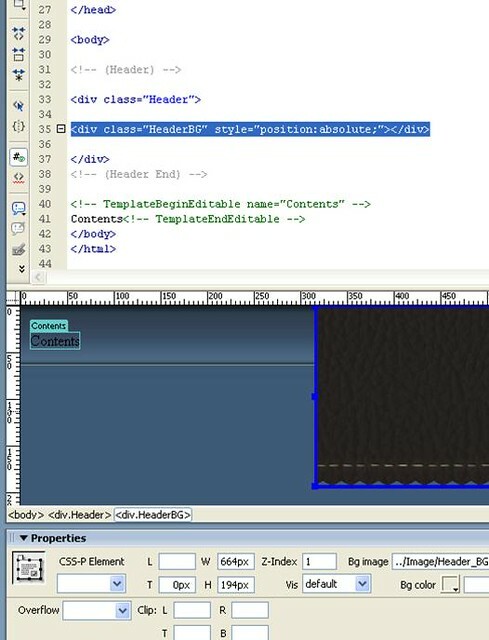 I’m using .Headertext to create a new html division for text, and .Headertext h1 for <h1> tag that relate with .Headertext, I know this is a little bit complicated, maybe they could be more simplified, but I like to use the code in separate divisions, for more flexibility and future planning. I think, that’s all for the basic header, see you in the next entry.